← Day 23: Ear Candling. 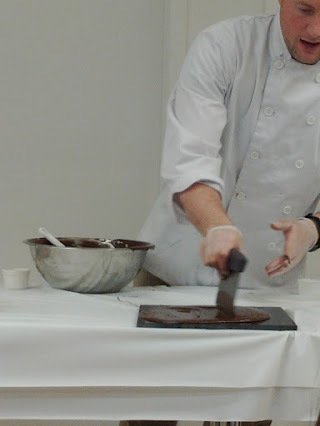 Ya, making things out of chocolate is really hard work, so today, I took one for the team. I mean, I’m personally much more of a savoury than a sweet person, but I’m still a human being, and so if you don’t like chocolate, I’m afraid we can’t be friends, because that would make you an alien, and I’m not into the whole human-alien thing. It’s that simple. 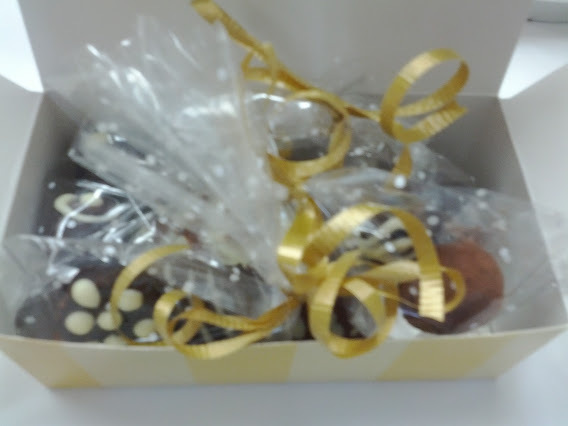 Did I mention today’s Chocolate Making Workshop brought to you by David and the rest of the magnificent folks at Chocolate Tales was another fabulous voucher purchase, courtesy of Daily Deal Tips (how I do love thee)? If you haven’t signed up already, then you haven’t been paying attention. This is just an entirely new deal dimension! But I digress. 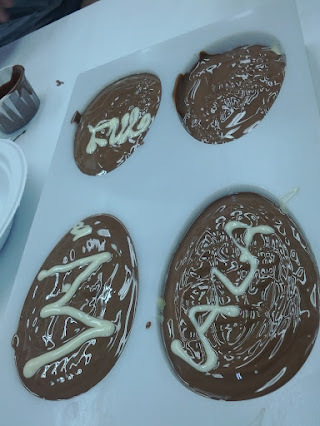 The workshop began with a festive Easter egg moulding session, where we used a diner ketchup dispenser full of molten white chocolate to decorate the outer shell, as well as to lovingly intersperse a couple of interior layers between ladles of liquid brown gold, aka milk chocolate. Let’s get this party started! To avoid anyone trying to guzzle the white chocolate directly from the bottle (surely I wasn’t the only one thinking it), David smartly provided us with a few tiny cups of different flavoured ganache – a liquid blend of heavy cream and chocolate = pure bliss. The mixes of chocolate with cinnamon, chocolate with ginger, and chocolate with cayenne pepper made our mouths salivate and tingle with delight. It was on! 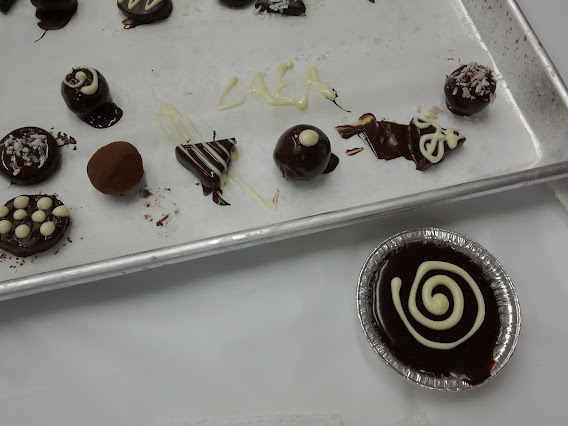 We made and placed our truffles onto a sheet lined with parchment paper to which we added our initials with more of the white chocolate liquid, and said goodbye as they went into the chiller. We were then given a spoon to use to ingest whatever was left of our molten ganache that we had not already guzzled right out of the cup. I mean, hello – it’s already in a cup. Why the extra utensil? I’m doing my bit to save the planet by not using a plastic spoon, am I right? 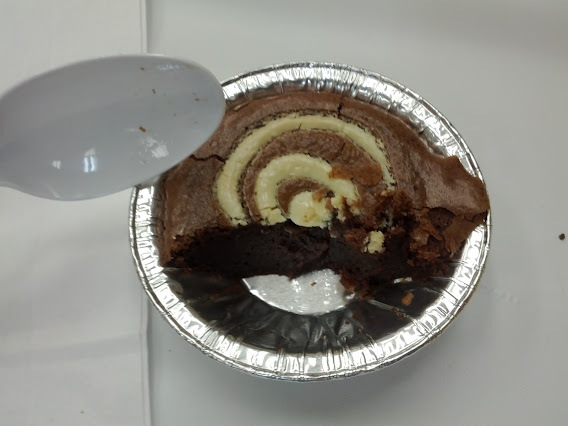 Finally, we got to add our own little white chocolate finishing touch to a pre-made molten chocolate cake in a little tin, which was then baked and that we were able to eat on the spot (or save for later… like that was gonna happen). 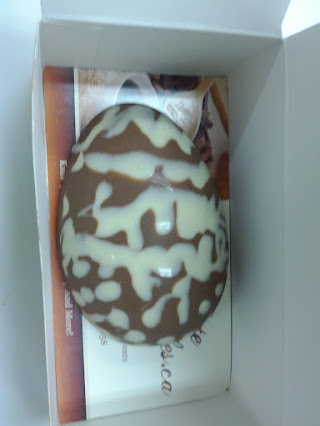 This was a nice distraction as we got to reclaim our now solidified Easter egg and truffles, and set to packaging them into little transparent bags and into a box cutely tied with ribbon so that you don’t eat everything before you get to your car. Although trying to tuck into them while driving when they are tied with ribbon might be even more dangerous than texting… just saying. Personally, I’m very proud of my creations today, and think that this would be a really fun activity for a blind date. I mean, even if the other person is a total dud, at least you end up with chocolate to eat, so you still come out ahead (pun unintentional). Enjoy! This entry was posted in Educational, Food and Drink and tagged chocolate, Chocolate Tales, Daily Deal Tips, deal, Drink, Educational, Food, March, voucher, workshop. Bookmark the permalink.